New Zealand Rockwrens are tough little birds. Living in high-altitude alpine habitat of New Zealand, their nests consist of excavated cavities within vegetated ledges, and cracks on cliff faces and boulders. At forty-four days, their nesting period is surprisingly long for a bird of that size. When confronted by a snowstorm during the breeding season, a parent may tunnel down through the snow to reach its chicks. Despite being warriors, could it be that New Zealand Rockwrens are helpless in the face of invasive mammalian predators? If a plant or animals has been moved by humans from its native lands, across a natural barrier, and has managed to establish a self-sustaining population in that new spot, then it is considered to be “introduced.” If that species goes on to have negative consequences for the wildlife or landscape of its new home, or on human health or the economy, then the creature is considered to be “invasive.” A number of invasive mammals are causing trouble in New Zealand. These include stoats, house mice, rats and possums. 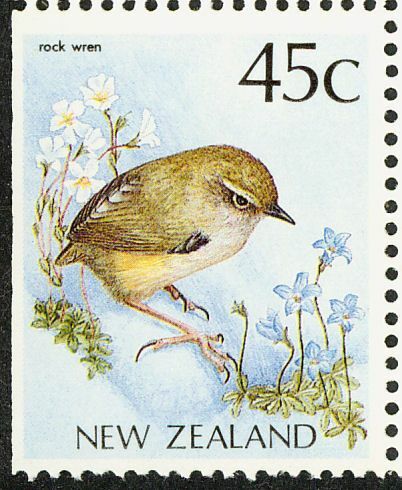 Numbers of the New Zealand Rockwren have declined to the point where they are considered endangered. Are invasive, predatory mammals to blame? Conservation biology Kerry Weston of New Zealand’s Department of Conservation and her colleagues studied the breeding biology of the New Zealand Rockwren, with particular emphasis on the potential impact of invasive mammals. At three high-altitude sites, Weston et al. searched for rockwren nests, and followed their progress. In some cases, nests were monitored using continuous video-recording and motion-activated cameras. Mammals were trapped and disposed of in some locales. Weston and her crew located 146 rockwren nests, and reported on some interesting aspects of the birds’ breeding biology. For instance, both parents contributed to incubating the eggs and providing for the nestlings during the day, but females alone incubated eggs and brooded young at night. As the nestling grew in size, they received food every three or four minutes during daylight hours. Nestlings are noisy, and can sometimes be seen begging from the nest’s entrance. The most common cause of rockwren reproductive failure was predation by stoats, rats and mice. Cameras revealed that stoats ate eggs, nestlings and brooding adults. However, in spots where predators were controlled, no predation by stoats was confirmed, and the leading cause of failure was nest abandonment, sometimes the result of extreme weather. In their five-year study, just thirty-three stoats, ten rats and one mouse were captured. Despite the low number of mammalian predators in the landscape, it was clear that these animals had considerable negative consequences for populations of the endangered rockwren. The impact of invasive predators on insular and lowland bird populations is well established. Less well known is the effect of invasive mammals on birds breeding at high altitudes. Weston et al. wrote: “Novel predator control techniques that can be safely applied at scale above treeline are urgently required.” Let’s hope that such control will be forthcoming, and that the New Zealand Rockwren’s endanagered status will soon be changed. Weston, K. A., C. F. J. O’Donnell, P. van Dam-Bates and J. M. Monks. 2018. Control of invasive predators improves breeding success of an endangered alpine passerine. Ibis 160:892-899. Photo courtesy of Pete McGregor.